In an ideal world, all pet owners might skip the canned food and serve up their animals exquisite meals of raw hamburger, raw eggs and raw chunks of cow liver. But not everyone has the time, or the stomach, to whip up such delicacies. Now there is a pair of Forestville women who will do it for you. Self-described animal lovers Tiffani Beckman and Cathy Silberman started a company last April, called Feed This, to make and deliver raw food diets, one of the latest rages for picky pet owners. The company could be a case study in how a new business can start from the germ of an idea and grow with pure personal energy. What started as a request for pet food help from their friends has since grown to 55 customers in the North Bay willing to pay $15 a week to pamper their animals. Beckman and Silberman make the meals four nights a week after getting off their regular full-time jobs, and drive around town delivering the meals when they get a break during the day. The women even worry about the business growing too fast for them to handle. While most veterinarians still figure that quality kibble is perfectly healthy for most dogs and cats, there is a growing movement that raw food is the best and most natural diet for pets. ``With the raw diet, you have to remember, did animals know how to cook? No. They're scavengers. That's what they like,'' Silberman said. The raw diet is exactly what it sounds like -- dogs and cats eat only raw foods, mostly beef and chicken necks along with bits of organ meat, raw vegetables and natural supplements. The idea, according to veterinarians who support the diet, is that dogs and cats naturally eat raw foods. Unlike humans, who have always cooked their meats, animals over time thrived on raw foods. It is only in the past 50 or so years that modern advances made it more convenient for pet owners to give their animals cooked, processed food. ``People used to feed the dogs the leftovers, the parts that we don't eat, the chicken necks and the backs and the gizzards and all of that,'' said Dr. Stephanie Chalmers, a Santa Rosa veterinarian who hired Beckman and Silberman to deliver raw food to her two cats. Silberman admits that vets sometimes argue against raw diets because, similar to humans who become vegetarian, without proper planning the diets can be limited nutritionally. But with a well-balanced diet, raw food is perfectly safe, she said. And some pet owners worry that the bacteria sometimes found in raw foods -- salmonella, for example -- could be dangerous for dogs and cats. But Beckman argues that many pets already eat plenty of raw food, from the mice that cats capture to the garbage that dogs often dig through. Beckman has been feeding her animals raw food for six years, ever since a vet she was working for recommended it for a sick dog. When Beckman met Silberman at a veterinary clinic last year, she recommended a raw food diet for one of Silberman's sick dogs, and the pet loved it. Between the two of them, Beckman and Silberman have four dogs and about eight cats in the Forestville home they share. All of them eat only raw food. Most of the animals were adopted from shelters where they were brought in sick and mangy. Now they all are healthy, well-behaved animals, and Beckman and Silberman said it's almost entirely because of their diets. Between the full-time jobs both women work, running their new business and sharing a home with a dozen pets, their lives stay busy. At least four nights a week they prepare meals for dozens of pets while their own dogs race around the house, kept out of the kitchen by a child safety gate. 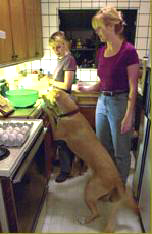 Beckman usually puts together the meals, which are developed specifically for each pet based on its size and tastes. For example, a local woman who runs a sheep ranch has raw meals delivered for her two border collies. Because the dogs are hyper and very active, they eat more food than most other dogs their size. Plus, because they herd sheep, their owner doesn't want lamb included in their meal. Just about every diet includes ``Bogie balls,'' named after a cat that belongs to Beckman's sister, one of their first customers. The balls are chunks of beef, eggs, ground up egg shells and liver mixed with powdered kelp, alfalfa, milk thistle and vegetables. Beckman mixes them in her kitchen at home then freezes them. She and Silberman deliver them during the day when they get time off from work. The meat they use comes from Santa Rosa Meat Company and is good enough for human consumption, Beckman said. The diets aren't cheap. They range from about $10 to $20 a week for a dog, but owners can pay more for rabbit meat and other exotic side dishes. Beckman and Silberman also offer separate menus for puppies and kittens, pregnant animals and overweight pets. People obviously are willing to spend more money on their pets these days. Huge pet stores are popping up everywhere, and there even are animal day care centers and professional dog walkers now. Silberman said their company doesn't have a lot of room to grow right now because they aren't yet ready to hire employees. But already there is such a demand for their products that they can't let up, she said. The business idea first came up last November, when their friends heard about their raw diet and asked the women to make food for their animals. Beckman and Silberman hired a business consultant and a lawyer to help them get the company started on the right foot. They put up a Web site in April. Within a month they had inquiries from 100 or so potential customers from all over the world. As of August they were making a profit on the business, Silberman said, though neither of them is ready to quit their day job. Beckman still works as a receptionist for a veterinary clinic, and Silberman is a managed care contractor at Santa Rosa Memorial Hospital and works part time for a local vet. The women aren't yet ready to ship food, and now make deliveries to about five dozen customers in the North Bay, with a few exceptions for the kinds of friends in San Francisco that caused them to start Feed This. Erin Allday can be reached at eallday@pressdemocrat.com or 521-5494.